For many mature birds across the world, sexual selection, or the process of choosing a mate, is a common practice. In fact, female birds are highly selective of which males they choose to mate with. The two most important factors in the selection of mates by female songbirds are the plumage (i.e. coloration of the feathers) and song of the courting male. Turns out, if you can pull off a good look and are willing to sing your heart out, then the bird dating world may be for you. Both plumage and song can be very informative in choosing a mate. The plumage is an indication of the overall health of the individual because the coloration is a reflection of physiological condition. The plumage can vary year to year depending on the health of the bird and its ability to consume foods rich in carotenoids, which are fat-soluble pigments ranging from red to yellow. Beyond birds, these pigments also give sweet potatoes and carrots their orange coloration! Females are also attracted to male bird songs. The number and complexity of songs is typically linked to the bird’s age and level of maturity. Therefore, female songbirds can assess the fitness of a male songbird through physical signals such as plumage and auditory signals like songs. But do you need both beautiful plumage and an enticing song to win a mate? If a male’s plumage coloration isn’t as great as another male, how does it respond? Does it give up or does it engage in more song? Researchers at the University of California Davis were motivated to seek answers. The House Finch, Haemorhous mexicanus, is highly social and non-territorial songbird and was used by Lindsay Henderson and her colleagues in several courtship experiments. 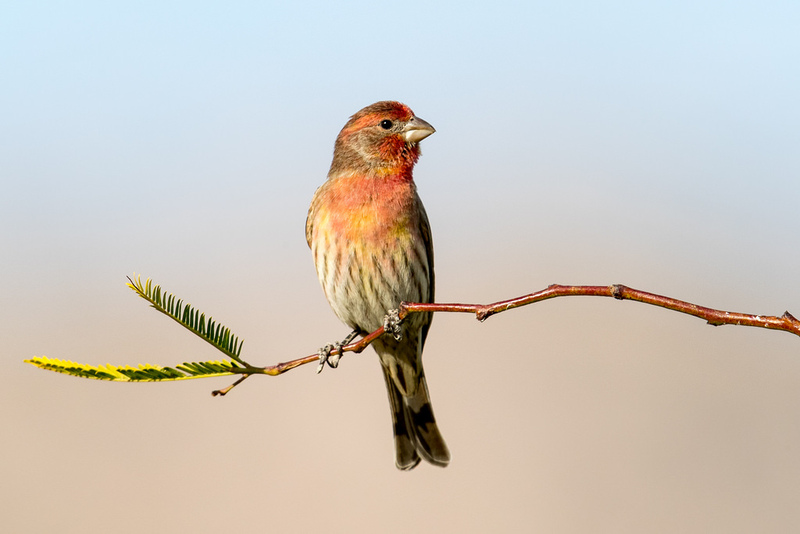 In the wild, female finches prefer to mate with males that have red plumage; however it is also common for the house finch to have yellow feathers. In Henderson’s experiment, prior to mating season, males were separated into two groups and fed two diets. One diet caused red plumage, while the other diet led to yellow plumage. The males were then housed together in three communities. One community consisted of all red male finches, another consisted of all yellow male finches, and the last consisted of a mixture of both red and yellow males. Next a male and female were placed in separate cages adjacent to one another. The songs and the behavior of each bird was then recorded over a two hour time-span. Figure 1. House Finch, Haemorhous mexicanus. Source: Wikimedia Commons. Social standing played a large role in determining the duration of song in male house finches. Red birds sang for longer than yellow birds because of their social standing; females prefer red males. Males from either a total red bird community or a community with a mix of red and yellow birds also sang more than birds from a strictly yellow male community. However, the complexity of songs did not differ among the different male bird communities. An attentive female would often fly in circles in the cage while looking back at the male. The researchers noted that females flew in circles more often when presented with a red rather than a yellow male, even when the males were from a mixed community. Figure 2. House Finch with red and yellow plumage. Source: Mick Thompson, Eastside Audubon. This study provide novel evidence that it’s not just the color of an individual’s plumage that influences the investment into a song but also the plumage color of his competitors. When yellow males were in a community with other yellow males, they tended to have limited song production compared to when they were housed with more attractive red males. This suggests that it was the male’s social group that influenced its song performance. The timidness of yellow finches may not be entirely social, however. Acquiring such a rich plumage is metabolically costly. When faced with lower levels of carotenoids, yellow males may invest their limited energy in basic functions rather than song displays. Therefore, the yellow birds may have been physically more stressed than red birds and reduced energy levels used for singing. From this study, researchers are better able to understand the evolution of birding courtship. The strategies males use to attract females and the mechanisms that regulate them are influenced by the bird’s social environment. Turns out, it takes more than just a pretty song to wow a female finch.